This is a nice exercise in combining summery, pale colours. The challenge is being light and pale overall, while retaining enough contrast between shirt, jacket and trousers - both in colour and texture. The starting point is the jacket, made for me by Elia Caliendo in a light-grey linen. As with most outfits, this started with the desire to wear a particular piece that day - and the linen jacket was it. Picking trousers to go with a grey jacket is not easy, as we have discussed previously. The standards of grey and navy are not available (grey because the jacket is grey, and navy because it rarely works as an odd trouser) so we turn to the secondary menswear colours of green, brown and tan. Here, I've gone with the light-green cotton trousers from my suit made by Spanish tailor Reillo. The jacket didn't work out very well, as mentioned previously, but the trousers are still useful. Dark brown also works - I have worn the brown Crispaire trousers from my Dalcuore suit with this same jacket, and it works well. Cream would also be good, and it goes with pretty much every colour of jacket. But obviously not on most grey, English days. Of the two obvious shirts colours - white and light blue - the former is the most effective here. Blue doesn't have provide enough contrast with either the jacket or the trousers: the whole starts to merge into one dull block. Of course, pattern would also have been effective in providing contrast: a nice strong and broad blue/white stripe, for example. The shirt here is actually a summer prototype for the Friday Polos that I design with Neapolitan Luca Avitabile. It is therefore ready-to-wear, which is why the sleeves aren't quite long enough and the collar not quite high enough. Wearing a polo generally with an outfit like this, however, does give it a nice relaxed, summery vibe. 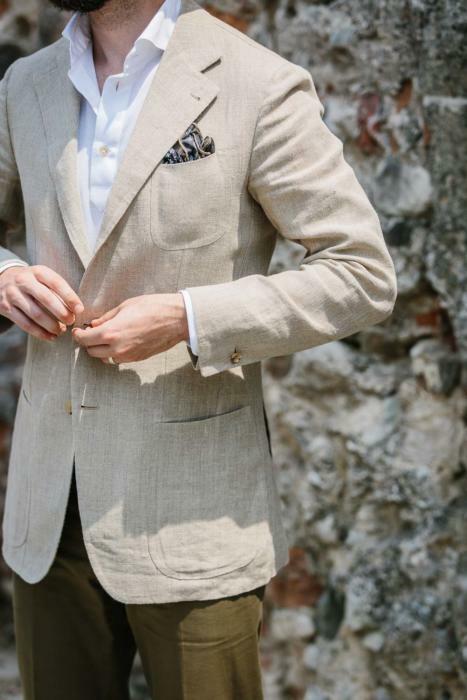 Combining linen and cotton in an odd-jacket-outfit is also a good way to ensure contrast in texture. The linen will always have a little slub and crease to it, while the cotton is smoother. 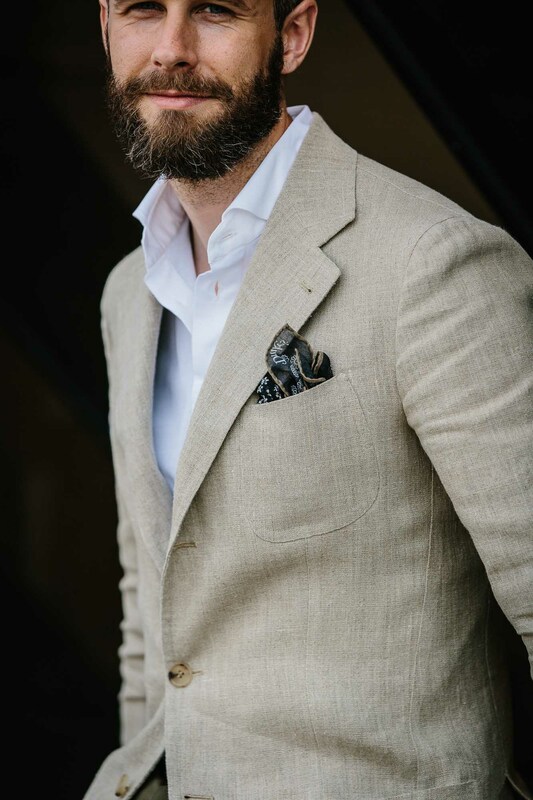 The pocket square, from Drake's via The Armoury New York, is similarly simple and muted - a navy with grey motifs and tan-coloured edge. 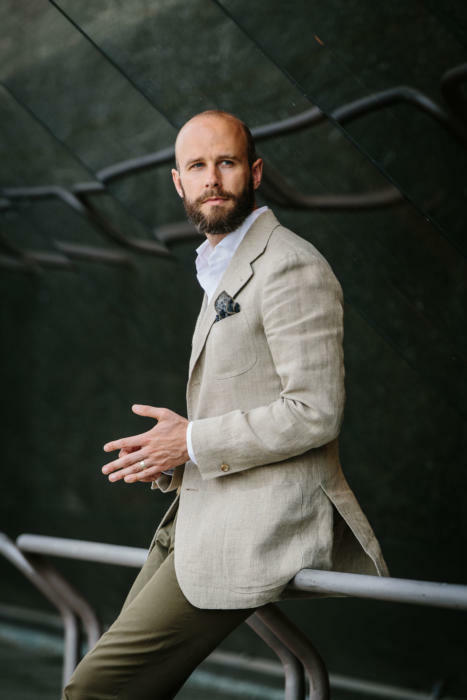 The outfit could have handled something brighter or stronger in the breast pocket, given the muted look elsewhere, but it would have become the focal point of the whole piece. Combinations like this, increasingly, are how I like to dress day-to-day. Simply and effectively. It's unlikely to be picked up among the peacocks of Pitti. But these days that's quite a compliment. The hat, in stiff sisal straw, is from the Anderson & Sheppard haberdashery. I'm not a huge fan of the material, but I do prefer the brown colour to other, bright-white panamas. It's more subtle and informal, and given how few people wear hats these days (even in the glaring sun) subtlety is good. The grey linen, by the way, is from a vintage bolt I bought at Wilhelm Jungmann und Neffe in Vienna, which has some lovely old pieces. This is particularly unusual, being very heavy and coarse - almost more like canvas than modern linens. And on the feet were the bark-grey Sagans I designed for Baudoin & Lange. You can follow the discussion on Pale summer colours (in vintage linen) by entering your email address in the box below. You will then receive an email every time a new comment is added. These will also contain a link to a page where you can stop the alerts, and remove all of your related data from the site. such a nice blazer Simon. Do you know the cloth? “navy because it rarely works as an odd trouser” …. I would have thought navy or a lighter blue was an obvious choice . But a great use of green . In addition , if I could suggest, photo with the different trousers to illustrate the points in future . Thanks. Photo coming with the brown trousers soon. I have a question about using suit trousers with another jacket as you have here. I have always been wary about using suit trousers for anything other than the suit because the trousers tend to get more wear than the jacket does. I mean one of the first things I will do on entering my office is to take off the jacket and so it will stay until meetings, lunch or going home. This means the jacket gets very little wear; if I then starting wearing suit trousers with an odd jacket (very nice look by the way and I too favour a mid green cotton with grey in the summer) wouldn’t the wear become even more obvious? Yes, absolutely, and I wouldn’t do it very often for that reason. In this case, of course, the jacket didn’t work out so isn’t worn anymore – leaving me with trousers that can be worn more freely. Simon, lovely jacket. Could it work with very dark jeans? A timely post – I have been thinking of the problem of contrast in the recent hot weather. Too many of my summer trousers are light in tone (white/cream/beige) and too many of my shirts the same (white/pale blue). An outfit including both can work well with a darker jacket, but if the jacket is removed then the shirt and trousers don’t work alone. So your tips are good ones – time to explore green and brown trousers. This is a really difficult one to get perfect. Jacket and shirt are spot on. The trousers just miss the mark. Maybe a slightly different shade of green or the brown would do it but it would be forever limiting and that is why I tend to steer clear of very specific matching. I prefer things that are very versatile. This is a lovely Summer outfit with its muted colors, but very effective indeed! With a more formal white shirt, what kind of tie would you pull off that could work also effectively while remaining within the boundaries set by colors and textures. Don’t agree about navy I’m afraid: a hopsack or mohair would work very well and not look like they’re from a suit. Also the button point is off, as it seems to be on most of your jackets. Is this a personal choice? 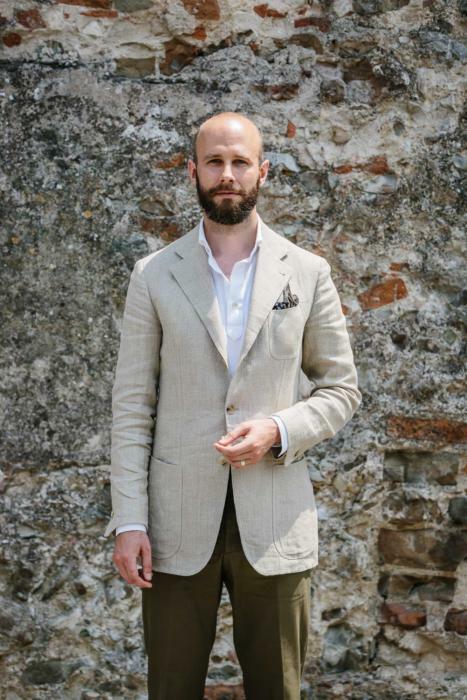 Hopsack rarely makes a good trouser as it is usually an open weave, which is why it is good for a summer jacket. It would have to be a heavy weight, and therefore not suitable to this summer weather. I have a number of summer trousers from hopsack and it is the openness of the weave which makes it perfect as it is soft, somewhat unstructured, and breathable. Re your button point, they always look too high. 1.5″ above your tummy button should be as high as you should get, but yours look to be above that. You bought a whole bolt? What are you doing with the rest? So, Simon, this very outfit, “simple and elegant” as you put it so precisely, is hard to improve. At least if it were worn by somebody with a different, i.e. darker, skin complexion. Hence, I disagree that a bright white shirt is the best choice for you. You have such a nice, “cool” teint, but when you add a harsh white to that and top it with a greyish jacket, the whole result really doesn’t flatter you colourwise; take a look at photo no. 4 above. Instead, a full fat soft white or cream coloured shirt, with a smooth texture complementary to the jacket would probably have done the job for you complexionwise. And, contradictory to your own belief, a light blue shirt with a smooth’ish surface (why not be bold and try silk for a change?) would definitely not create “one dull block”. 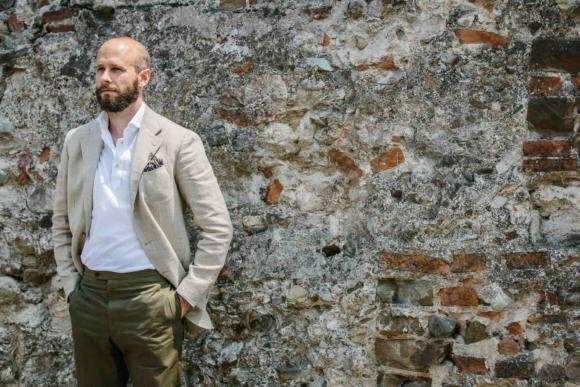 I hope I am not out of line here (forgive me, I am from Denmark) but the matter of complexion, oh ye English gentlemen, is almost as much a part of the dressing well equation as is fit, colour and texture. I would be interested to know whether a light mid-grey fresco trousers would work with this jacket. Thanks. To be honest, I don’t think a mid-grey works, and I did try, but I agree it is tempting to talk in extremes when the reality is that it’s just hard to make it work. For example here, a mid-grey trouser might be helped if it was a very clean, sharp texture, which would be very different to the jacket. I’ve been a reasonably long time reader of your website, occasional commentator. I liked to say that as an amateur photographer, I enjoy the accompanying photography as much as I do your posts about tailoring and craft. This comment has been prompted by the image second from top against the masonry wall. While to many that may seem ordinary, but I’m sure that photographer Jamie (or yourself) would have seen a complimentary colour palette to your ensemble in that. Needs to be enlarged to fully appreciate. Great stuff. It’s interesting to discuss trouser cloth, colour etc, but I think cut is important as well. My “casual” trouser pattern differs from that I have for a suit. Slightly looser through the seat and thigh, a more open forward single pleat, and mainly belt loops gives a more casual air. I think it is this, more than anything else, which makes a casual trouser casual. Any suggestions on a good weight for a linen jacket? I’m thinking around holding its shape. Appreciate it’s linen and so will crease but weight must have a bearing. It does. Generally the Irish linens from W Bill, H&S etc are around 11oz, and the Italians more like 9oz. You can see the difference clearly if you compare my Dege & Skinner and my Langa suits. The former is heavier and keeps a lot more shape. I know your a fan of Incotex Simon but what do you think of Cordings cotton chinos.I really like the heavier cotton trousers.They keep their shape well and presumably will last longer…although the latter is not a prime consideration.The only thing that I can think of that would put you off them is perhaps they are not cut quite so slim in the thigh as compared to Incotex. The big difference between the two is that Incotex are largely garment dyed or washed, which gives them the slightly worn, faded look most of us associate with chinos. Cordings cotton trousers are more similar to regular tailored cotton, if I recall. So a better comparison is probably with these bespoke pieces – and then, yes the width through the leg would be the key thing that might make Cordings a little old-fashioned. I’ve just been told that I need to cover up a little more this summer and need to wear a hat when out in the sun. Do you have any thoughts on summer hats that you could share. At 48 years old, I am well beyond a cap, but are there any stylish options other than a panama? Many thanks. Apart from Locks, are there any good hat shops you could recommend? 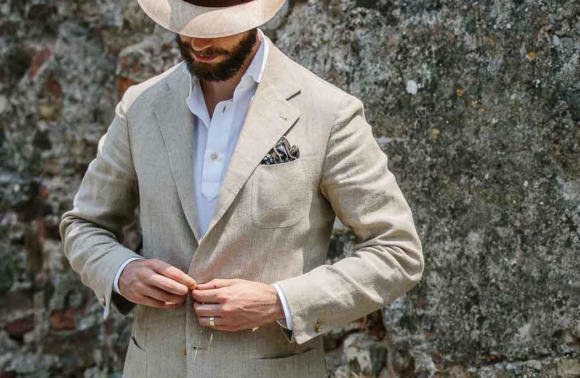 Where can I buy a good linen jacket in London? Any suggestions? Trunk, Thom Sweeney, Timothy Everest. Bear in mind that most are now at the end of sales or have moved onto winter stock, though, so there won’t be much left. I ended up with a bespoke jacket bought from Davies and Sons and done by Mr. Patrick Murphy. It is cheaper with ready to go but I never seem to get really satisfied. Fabric will be wool with mohair mixed in. Light and airy. Colour is pale blue. Who made your wedding band? It’s very elegant. Thank you. It was made by a jeweller in Hatton Garden here in London, and is a copy of my father’s band. Another great outfit put together with precision and thought – thanks for sharing. As one commentatator also points out the photography is also of note. You are (of course) bang on about grey – the other night I tried matching up some of my grey tweed jackets with trou – green and brown win every time. Given the light shade I was thinking a denim coloured shirt might also work. Love the hank, though the outfit is subtle it adds a (small) exclamation mark! I don’t know if it’s just me, but I’m seeing more and more 3-roll-2’s. Why choose that over a regular 2-button jacket? They have been becoming increasingly popular because the Italians, particularly Neapolitans, do them a lot. The English rarely have, and when they do, rarely well. The jacket looks too long. Is it actually longer than your other (suit) jackets or is it possibly because of the odd jacket contrast? I also find the trousers too loose vs the jacket. Is it your choice or the tailor’s? It is the same length as my suit jackets, slightly longer than most sports jackets. The trousers are not loose, but lightweight cotton will always look a little like this. In general, as I always say, it is dangerous to try and judge fit of clothes from photographs. Hi Simon, not easy to find heavy linens but they do look nice. How much do you think this particular vintage linen weigh? More than 320 grams (11oz) I would guess… Would you recommend very heavy linens (350 – 400 grams) for autumn or spring? I would guess it is about 11oz, no more. Heavier linens can be nice, but think why you want them. Often it’s for a cloth that hangs and drapes better, but linen is always going to be undermined by wrinkling. I wanted a linen jacket for summer, I have the choice between Fox Beige Melange linen and Olive Melange Linen, which one would be most versatile and which would be best with Jeans? I love the look of that coarse linen. I assume the jacket is canvassed but unlined? Looks like this fabric would also work for a completely unstructured jacket (no canvas or lining) for a more casual look. It’s partly lined – in the sleeves and the top of the back. To be honest I would always have this, no matter how casual the jacket. It’s just much easier to wear, and makes no difference to how it looks from the outside.